« Post of the Year! Okay, so clearly I’m not a blogger. It seems I don’t find my life particularly interesting on a daily or even weekly basis, or at least not so much I don’t think I should be doing other writing. But since I’m planning to use this site as a placeholder while I throw together danhershfield.com (coming soon! ), I thought I’d bring things reasonably up to date in that classic bullet-point style you’ve come to love. Enjoy! -Looking back, I don’t know if I ever mentioned I was doing The Bench. Well, I did. It’s a Second City development show and sometime in this month, my first season ended. Tah dah! -Matt McCready and I are hired as improvisers to test scenarios for a game show where people have to run around in public debasing themselves. So we were debasing ourselves except instead of doing it in the hopes of making big money, we were doing it for the certainty of being paid small money. My contempt for that genre grows. -Yet another production of Courting happens! -Rob Ford is elected. I spend days wandering around aimlessly, looking angry and confused. -I come back for a second round of The Bench with a whole new cast. 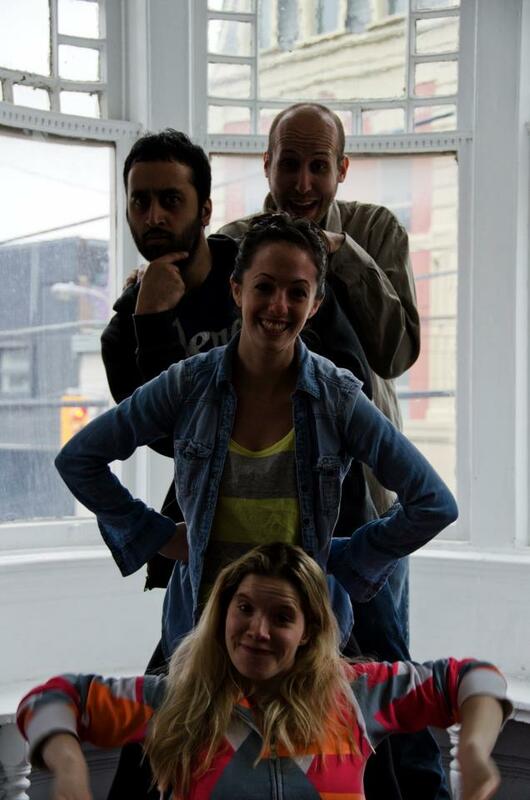 Several members go on to further success with Second City. I am not one of them. -Sketchfest happened. I don’t remember much of it (nearly two years ago! ), but it’s always fun. -For the first time ever, I shelve a video I wrote. It’s called Go Fish, and if I ever learn editing, I might try playing with it some and seeing if something can be salvaged, because the people were great and it looks beautiful. I choose to take it as a positive for my development that I’m willing to shelve something. -I do a bunch of the Bad Dog’s Christmas shows (It’s a Wonderful Improvised Life, Frosty the Show…man…) in what is to be their last Christmas at that theatre. And my friend Dave from high school visits from New York and sees me perform for what I think was the first time, so that’s kind of neat. -I see Die Hard on the big screen. God bless us, everyone. -We find out that the Shanghai restaurant in Winnipeg is closing. Probably good for our family’s collective health and taste buds, but still, the end of an era. -The Chief comes to town and a bunch of us go for drinks at the James Joyce. Noteworthy not just because a visit from the Chief is always noteworthy, but also because the James Joyce has since shut down, and that night, fistfights were breaking out all over the place. It was very classy and amusing. -New Years at Tom and Lindsay’s. Good times were had. -The end of the Bad Dog. It was great while it lasted. I am in something like three of the last six shows, and one of them goes really well. It was a Dr. Jekyll and Mr. Hyde premise by Ely Henry, and also had myself, Sean Tabares, Kayla Lorette, Matt Folliott, and Paloma Nunez in it. Very fun. In my mind, I am trying to remember that as my last show there, even though I know it was not. -Something interesting probably happened in March. Well, there was my birthday, let’s go with that. -Oh, and I won my March Madness pool. Booyakasha! -And for April, let’s say…Passover? -And “British Humour”! A web short I wrote that I love for several reasons. Jim Annan was in it WILLINGLY! Which was awesome and gave me the warm fuzzies. Also, I got two incredibly funny standups/actresses, Amber Harper-Young and Georgea Brooks Hancock (one of whom was my brother’s ex) to play DEAD PROSTITUTES! I still don’t know quite how I pulled that off, but I remain very grateful. (As I am to Brian Chambers and Brad Sayeau, but I’m often indebted to them.) And it ended up winning at My Tapes, which was pretty cool too. Enjoy! -The federal election happens. I am acting as a Deputy Returning Officer, and so am spared the agony of watching the results come in. Mind you, being a Deputy Returning Officer is its own form of agony, but at least that was new. -I’m in a show called Aesop’s Improvised Fables. You can probably figure it out from the title. Fun times, fun cast, etc. -Larry has surgery. He calls it a “procedure”, but it’s a surgery. -I’m a juror for the Canadian Comedy Awards in the TV Writing category. I get a lot out of diligently watching all the submitted videos both in terms of pleasure and study. That said, when I see the nominees, I’m pretty surprised, which is probably odd for a juror. -William Shakespeare’s Beauty and the Beast rehearsals dominated this month. I was directing, and it was great to put that particular hat back on after a fairly lengthy absence, especially with a fun cast and absolutely life-saving stage management. I’d write their names and other relevant details, but that’s what the poster is for! -Also, Robin Archer and I get together to brainstorm ideas for a project, and end up settling on “Dan and Robin Survive the Apocalypse.” Nothing has really happened with it so far, and Robin just had a kid (huzzah! ), so it’ll probably be awhile, but I love it so much, I mention it here so that when it does happen, it will be clear that I never lost faith. -The last Comedy on the Danforth show of my first season happens. I made it! 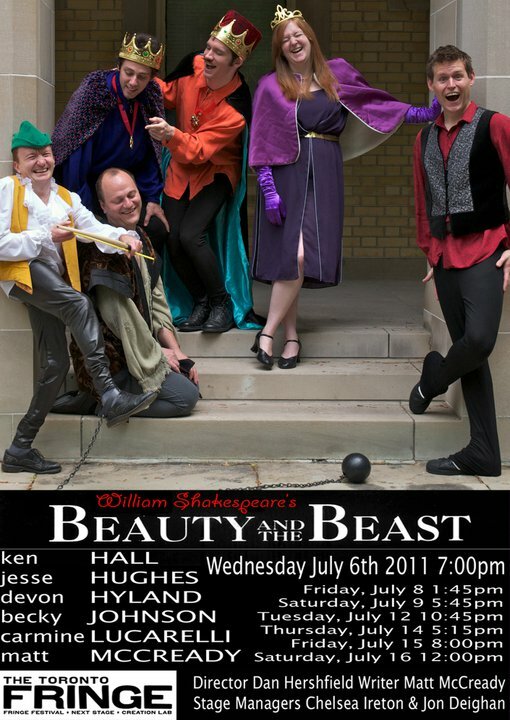 -William Shakespeare’s Beauty and the Beast plays at the Toronto Fringe, and due to Ken and Devon both booking paid work, I end up subbing in to most of the shows. Viva la Fringe! -I work on the census. It’s kind of like Fight Club, in that the first rule of the census is that I’m not supposed to talk about the census, so I won’t, beyond saying that I worked on it. -Tory comes to town. We hang out. It’s awesome, though sweltering. -I hang out with Mark McGuckin at Comedy Bar, and then we go see Two Kids, One Hall (that’s Kevin McDonald and Scott Thompson) with my brother. So much was right about that night, I hardly know where to begin. -I work as basically a stage manager on Watertight, Mike Fly’s Pilot Week submission. Worth mentioning because I’m sure someone who worked on that will some day be the King or Queen of All Canadian Media. -Camp Hershfield again, but a very special Camp Hershfield where health problems I’d been having but ignored or dismissed as aging come to a head. To the point where I have to go to the hospital with what feels like severe heartburn. We find out further down the road that I had a hiatal hernia. What we find out immediately is that my iron levels are shockingly low, to the point where I need to be transfused and where the only possible reason would be internal bleeding. In retrospect, I’m an idiot for thinking my fitness level had deteriorated that quickly (I was getting out of breath on staircases!) But other than that, a lovely time. And they get me on iron, which turns things around pretty immediately. -I make this Working Families video with old Vancouver amigo and all-around awesome activist Sean Devlin. I’m not saying it made the difference, but it’s the only election that year that even remotely went my way, so I’m taking credit! Also, those glasses were actually taken off the head of one of the crew, so though they do look cartoonish, it’s only because of disparity in head size! -Peter Molnar, of high school friendship, gets married. I am that much more the last man standing. -TIFF happens. I have fond memories that I can’t remember. They’re written down somewhere, just not here. -The Comedy Awards happen. I have nothing to do with the Comedy Awards, but I do get to hang out with Kaitlin Fontana (over a lovely if eventually rushed Indian dinner) and then Morgan Brayton and Michele for drinks. Trip to Vancouver yet again made less necessary! -I get a scan on Halloween related to my health problems. It does not give me special powers or turn me psychotic. As far as I know. -I do a corporate gig with Lauren Ash and my brother out in the boonies, and then drop in on Rob Hawke’s book launch party. I include it here because it was one of those bizarre nights that I’m sure will inspire me asking “When was that?” at some point in the near future. -I start a writing group with Brian Crosby and Ian MacIntyre. Easily the best thing I’ve done in years. -I go to the Sing-along Sound of Music with Ashley Botting. I don’t have to explain myself to you people! -I have a submission rejected by the New Yorker. Sure, it would be a better story if it had been accepted, but still! -I have my surgery. It literally dominates February, but it’s been smooth sailing ever since, knock wood, kenahora, etc. -Darcy visits. I meet his daughter. I’m old. -Then my birthday. This one freaks me out a little. -I finished second in my March Madness pool, thanks to the choking of Ohio State, though I did have the most correct brackets. I still consider myself The Man. -Claire gives us a health scare, with much head-tilting and falling. But she bounced back. -Also, this Maisonneuve article comes out (as forwarded to us by the Chief.) My connection to this little piece of music history is that I wrote lyrics (and am credited) in the Ma Beans and Her Dirty Funk EP that this victory paid for. And frankly, anyone who’s heard “Milking the Funk Cow” would agree that the right choice was made! Ma Beans and Her Dirty Funk, The Article! -I attend the “From the Story Room to the Page” at the CFC. If I get into that program, knock on wood, kenahora, etc., this will retroactively become a big moment. -There is a group trip to see The Avengers. NERDS!! -Pinocchio is actually performed. Kids are cute. -There is a corporate training gig for Bad Dog that is awesome. I meet some new folks, who are absolutely delightful, and hang out with some old friends, which is great. And we find time to lounge by the pool! And Ken Hall gets an awesome new nickname, which I’m keeping to myself, because I feel if you weren’t there, you shouldn’t get to call him by it. But trust me, it’s awesome! So that’s what happened. More or less. So…what’s doing with you? 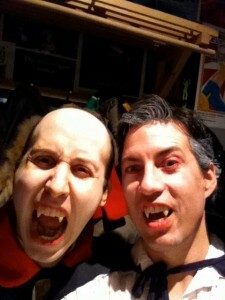 This entry was posted on Thursday, June 7th, 2012 at 1:31 pm and is filed under Uncategorized. You can follow any responses to this entry through the RSS 2.0 feed. You can leave a response, or trackback from your own site.